Recently I had the chance to explore the underground world of an abandoned coal mine in Raša near Labin, just off the eastern coast of Istria. Labin and the surrounding area was the centre of the mining industry in Istria: there were six mines in operation here from as far back as 1785 until 1999. 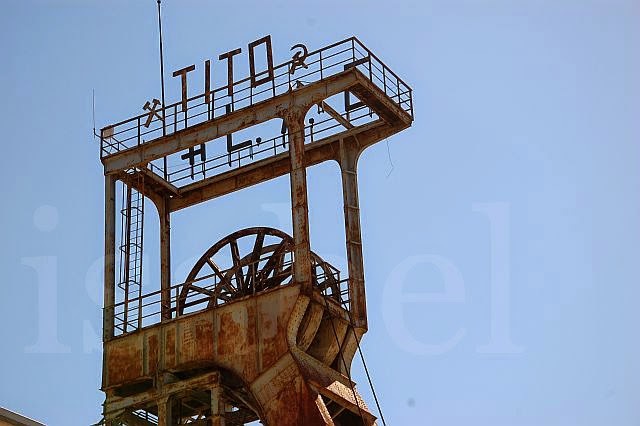 Mining is an important part of Istria’s social and labour history. At one time, the mining industry was the largest source of employment for local people. My grandfather had also worked for some time in these mines. 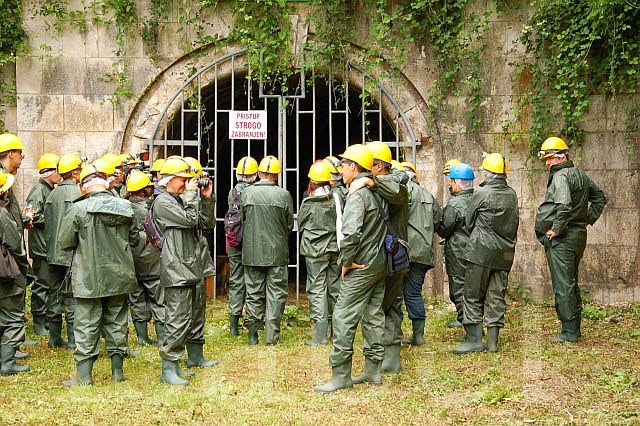 The tour of the mine in Raša was organized by Istra Inspirit, an organization which presents historically-themed events across Istria, showcasing a cultural or historical aspect of local culture combined with theatre and gastronomy. The meeting place for this event was the site of the derelict mine in Labin where after donning rubber boots, protective clothing, helmets and headlamps, we boarded a bus for the short trip to Raša. Lidija Percan’s unmistakeable voice singing La mula de Parenzo accompanied us all the way there, transporting us to another time. We quickly arrived in Raša, a small, ugly town in a stunning natural setting. 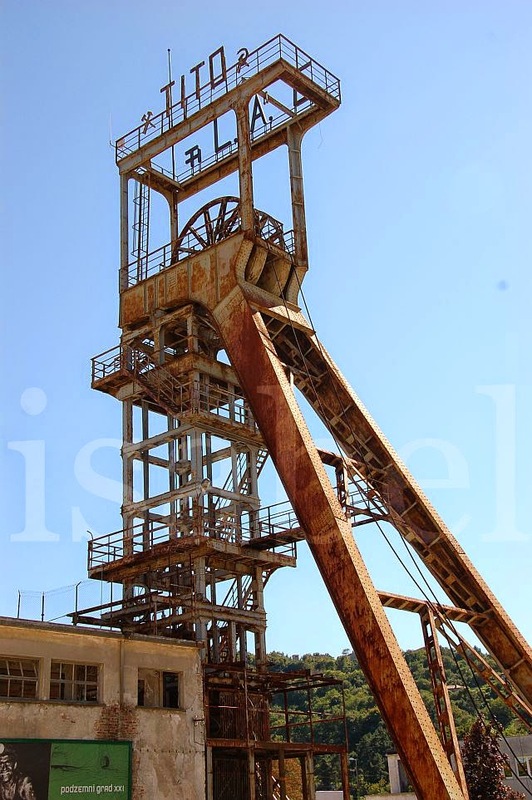 Today Raša is a testament of its mining past as well as the period when Istria was part of fascist Italy. Though the mine here was already in operation from 1928, the town of Raša (Arsia in Italian) was built in 1937 under Mussolini’s rule, an example of one of his many industrialization projects. The town was built exclusively for the needs of the mining industry and included housing for the miners, a town square, church, hospital, school, cinema and swimming pool. The architecture here is very dated and typical of the fascist ‘modernist’ architecture of the time. Accompanied by a guide, an older man and former miner, we entered the mine through what used to be the exit gate for wagons loaded with coal. It was pitch dark in the tunnels so our headlamps came to good use. We could see the remains of the electrical lines overhead but there were no railway tracks remaining. The guide explained that the underground tunnels run for over 400 kilometres on over 30 horizontal levels. Most of them are now underwater. This mine was in operation from 1928 to 1966, employing over 10,000 men who worked in three shifts, extracting coal day and night. Walking through the dark tunnels, sometimes through mud and water (the rubber boots came in handy! ), we could imagine what conditions were like. It was quite cool underground, but the guide told us that temperatures in the tunnels often rose to over 50 degrees Celsius and humidity levels were high. Coal mining was dangerous work and the miners faced the possibility of death on a daily basis. There were several fatal accidents caused by explosions. The biggest tragedy in the history of mining in Istria happened here on 28 February 1940 when 185 miners died and over 100 were injured. My grandfather was working here at this time and apparently had not reported to work that day because he was sick! Explosions were fuelled by the deadly mixture of very flammable coal dust and the build-up of methane gas. The miners would carry a metal disk with their personal details so that they could be identified in case of an accident. As we trudged through the dark tunnels, we came across a miner busy chipping away at the walls with a pickaxe. 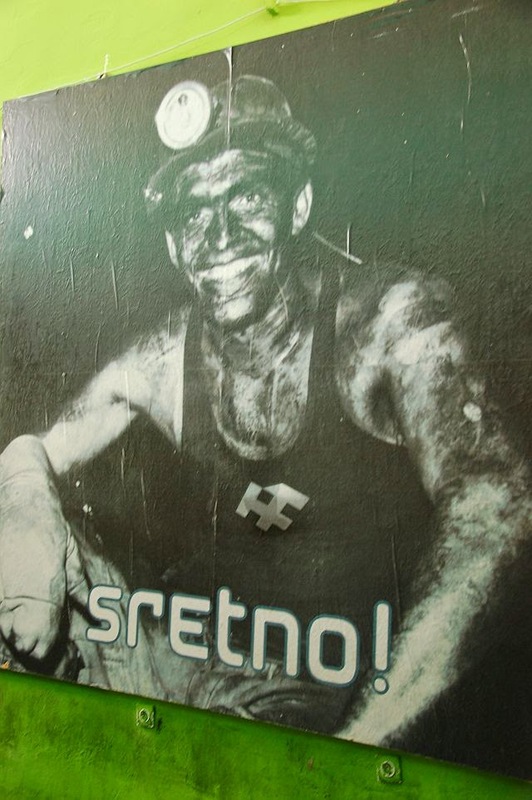 No, this wasn’t an unfortunate miner who got stuck in the mine after it closed in 1966 – this was the ‘theatre’ aspect of all of Istra Inspirit’s events. He rounded us up and told us to get to work, showing us how to distinguish between coal and stone. Soon we were walking through the muck again and approaching a loud, booming voice speaking from a megaphone asking us to turn off our lamps. The voice belonged to a long-haired Che Guevara-type figure who narrated through his booming megaphone the story of the miners’ strike of 1921 which turned into an anti-fascist rebellion and the declaration of an independent 'Republic of Labin'. This mini-revolution had lasted five weeks before the Italian army moved in and quashed it. But it seems the revolutionary spirit still haunts the damp underground tunnels because 'Che Guevara' told us that the mine is not completely abandoned: 90 years later, we the ancestors of the revolutionary Labin miners have started a new revolution: the establishment of an underground city. The mine is ours. Long live the miner’s republic! He asked us to repeat the miner’s greeting three times: ‘Sretno! Sretno! Sretno!’ (good luck) before inviting us to toast the miner’s republic with a shot of rakija. Today vestiges of Istria’s mining industry remain in the form of the old mine shafts and the modernist town of Raša. Mining had declined in the sixties, when coal reserves were already largely depleted, and came to a complete halt in 1999. This was also due to environmental considerations: though the coal mined here was rich in calorific value, it had a high percentage of sulphur which is not eco-friendly. Today, the coal-fired power plant in nearby Plomin is fed with cheaper sources of coal sourced from other countries. Though the mines in Labin and Raša are now defunct, the former underground world of the miners has not been forgotten. Initiatives like Istra Inspirit offer the opportunity to visit the mine and learn about this important aspect of local history. Meanwhile the Underground City movement aims to transform Labin’s abandoned mine into an avant-garde cultural and art project. This is my kind of tour...love this stuff! Thanks for stopping by Corinne! Puno hvala! Thanks for looking outside my window, come again! I too did this tour in 2014, and I loved it. I think rasa is a lovely town, with a fascinating and unique history. Hi to Milan at the café in rasa square if he's still working there. Great article, thanks. Thanks for your comment! I'm glad you had the chance to do this tour because it looks like it's been discontinued for the moment.